You need an emissions price in your portfolio to balance effort across all tradeoffs in the economy. IPAT shows that, to reduce emisisons, there are multiple points of intervention. One could, for example, promote lower energy intensity, or reduce the carbon intensity of energy, or both. Cover all the bases – ensure that no major opportunity is left unaddressed. Balance the effort – an economist might express this as leveling the shadow prices across areas. We have a lot of different ways to address each tradeoff: tradeable permits, taxes, subsidies, quantity standards, performance standards, command-and-control, voluntary limits, education, etc. So far, in the US, we have basically decided that taxes are a non-starter, and instead pursued subsidies and tax incentives, portfolio and performance standards, with limited use of tradeable permits. Here’s the problem with that approach. You can decompose the economy a lot more than IPAT does, into thousands of decisions that have energy consequences. I’ve sampled a tiny fraction below. The beauty of an emissions price – preferably charged at the minemouth and wellhead – is that it permeates every economic aspect of life. The extent to which it does so depends on the emissions intensity of the subject activity – when it’s high, there’s a strong price signal, and when it’s low, there’s a weak signal, leaving users free to decide on other criteria. But the signal is always there. Importantly, the signal can’t be cheated: you can fake your EPA mileage rating – for a while – but it’s hard to evade costs that arrive packaged with your inputs, be they fuel, capital, services or food. The rules and standards we have, on the other hand, form a rather moth-eaten patchwork. They cover a few of the biggest energy decisions with policies like renewable portfolio standards for electricity. Some of those have been pretty successful at lowering emissions. But others, like CAFE and Energy Star, are deficient or perverse in a variety of ways. As a group, they leave out a number of decisions that are extremely consequential. Effort is by no means uniform – what is the marginal cost of a ton of carbon avoided by CAFE, relative to a state’s renewable energy portfolio? No one knows. This is almost entirely due to success in the electric power sector. Hopefully, there’s more to come, as renewables continue to ride down their learning curves. But how long can the power sector carry the full burden? Not long, I think. The problem is that the electricity supply side is the “easy” part of the problem. There are relatively few technologies and actors to worry about. There’s a confluence of federal and state incentives. The technology landscape is favorable, with cost-effective emerging technologies. The technology landscape for clean fuels is not easy. That’s why LCFS credits are trading at $195/ton while electricity cap & trade allowances are at $16/ton. The demand side has more flexibility, but it is technically diverse and organizationally fragmented (like the questions in my table above), making it harder to regulate. Problems are coupled: getting people out of their cars isn’t just a car problem; it’s a land use problem. Rebound effects abound: every LED light bulb is just begging to be left on all the time, because it’s so cheap to do so, and electricity subsidies make it even cheaper. Command-and-control regulators face an unpleasant choice. They can push harder and harder in a few major areas, widening the performance gap – and the shadow price gap – between regulated and unregulated decisions. Or, they can proliferate regulations to cover more and more things, increasing administrative costs and making innovation harder. As long as economic incentives scream that the price of carbon is zero, every performance standard, subsidy, or limit is fighting an uphill battle. People want to comply, but evolution selects for those who can figure out how to comply the least. Every idea that’s not covered by a standard faces a deep “valley of death” when it attempts to enter the market. At present, we can’t let go of this patchwork of standards (wingwalker’s rule – don’t let go of one thing until you have hold of another). But in the long run, we need to start activating every possible tradeoff that improves emissions. That requires a uniform that pervades the economy. Then rules and standards can backfill the remaining market failures, resulting in a system of regulation that’s more effective and less intrusive. The growth forecast is completed in two stages. During the first stage SANDAG staff produces a forecast for the entire San Diego region, called the regionwide forecast. This regionwide forecast does not include any land use constraints, but simply projects growth based on existing demographic and economic trends such as fertility rates, mortality rates, domestic migration, international migration, and economic prosperity. In other words, there’s unidirectional causality from inputs to outputs, ignoring the possible effects of the outputs (like prosperity) on the inputs (like migration). Sometimes such scenarios are useful as a starting point for thinking about a problem. However, with no estimate of the likelihood of realization of such a scenario, no understanding of the feedback that would determine the outcome, and no guidance about policy levers that could be used to shape the future, such forecasts won’t get you very far (but they might get you pretty deep – in trouble). The key question for any policy, is “how do you get there from here?” Models can help answer such questions. 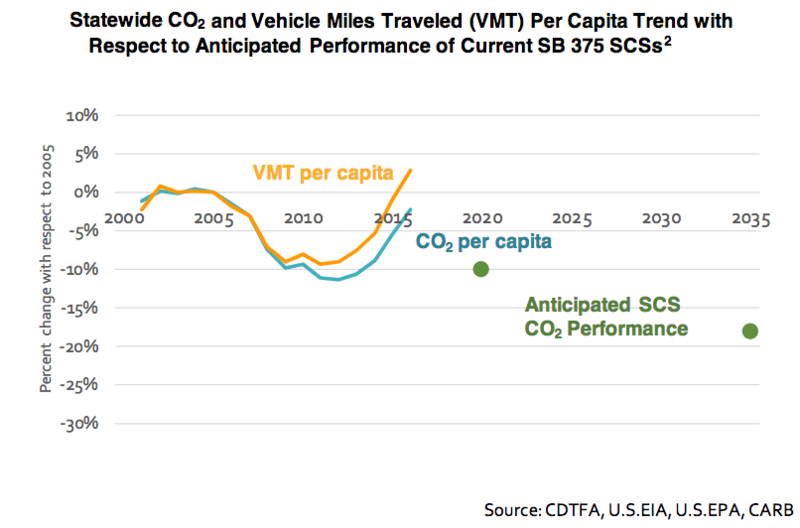 In California, one key part of the low-carbon fuel standard (LCFS) analysis was VISION-CA. I wondered what was in it, so I took it apart to see. The short answer is that it’s an open-loop model that demonstrates a physically-feasible path to compliance, but leaves the user wondering what combination of vehicle and fuel prices and other incentives would actually get consumers and producers to take that path. First, it’s laudable that the model is publicly available for critique, and includes macros that permit replication of key results. That puts it ahead of most analyses right away. Unfortunately, it’s a spreadsheet, which makes it tough to know what’s going on inside. 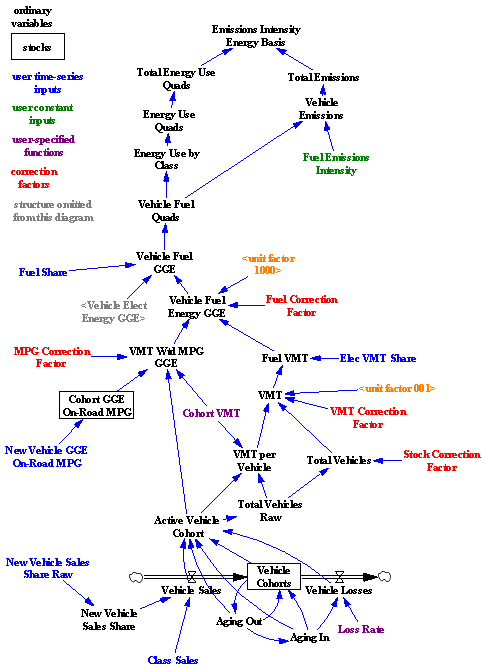 Bringing the structure into the light reveals that it’s basically a causal tree – from vehicle sales, fuel efficiency, fuel shares, and fuel intensity to emissions. There is one pair of minor feedback loops, concerning the aging of the fleet and vehicle losses. So, this is a vehicle accounting tool that can tell you the consequences of a particular pattern of new vehicle and fuel sales. That’s already a lot of useful information. In particular, it enforces some reality on scenarios, because it imposes the fleet turnover constraint, which imposes a delay in implementation from the time it takes for the vehicle capital stock to adjust. No overnight miracles allowed. What it doesn’t tell you is whether a particular measure, like an LCFS, can achieve the desired fleet and fuel trajectory with plausible prices and other conditions. It also can’t help you to decide whether an LCFS, emissions tax, or performance mandate is the better policy. That’s because there’s no consumer choice linking vehicle and fuel cost and performance, consumer knowledge, supplier portfolios, and technology to fuel and vehicle sales. Since equilibrium analysis suggests that there could be problems for the LCFS, and disequilibrium generally makes things harder rather than easier, those omissions are problematic. 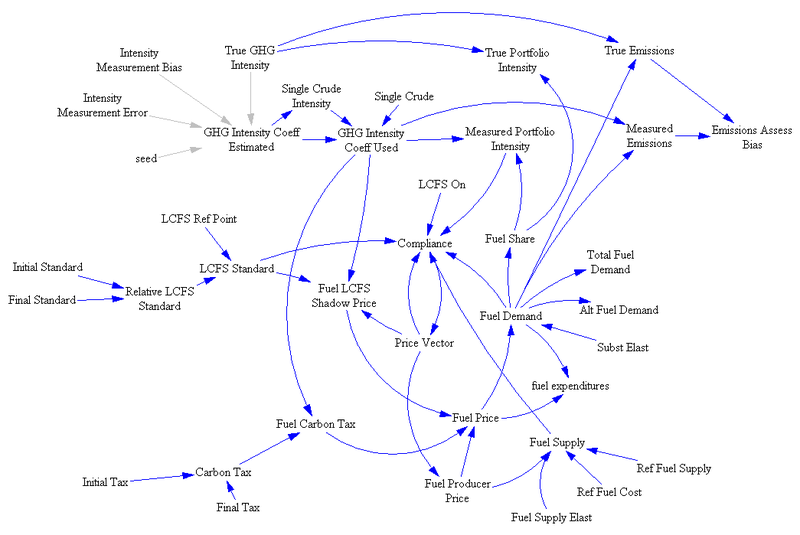 As a prelude to my next look at alternative fuels models, some thoughts on spreadsheets. Everyone loves to hate spreadsheets, and it’s especially easy to hate Excel 2007 for rearranging the interface: a productivity-killer with no discernible benefit. At the same time, everyone uses them. Magne Myrtveit wonders, Why is the spreadsheet so popular when it is so bad? Structure is invisible and equations, using row-column addresses rather than variable names, are sometimes incomprehensible. Dynamics are difficult to represent; only Euler integration is practical, and propagating dynamic equations over rows and columns is tedious and error-prone. Without matrix subscripting, array operations are hard to identify, because they are implemented through the geography of a worksheet. Arrays with more than two or three dimensions are difficult to work with (row, column, sheet, then what?). Data and model are mixed, so that it is easy to inadvertently modify a parameter and save changes, and then later be unable to easily recover the differences between versions. It’s also easy to break the chain of causality by accidentally replacing an equation with a number. Implementation of scenario and sensitivity analysis requires proliferation of spreadsheets or cumbersome macros and add-in tools. Execution is slow for large models. There are, of course, some benefits: spreadsheets are ubiquitous and many people know how to use them. They have pretty formatting and support a wide variety of data input and output. They support many analysis tools, especially with add-ins. For my own purposes, I generally restrict spreadsheets to data pre- and post-processing. I do almost everything else in Vensim or a programming language. Even seemingly trivial models are better in Vensim, mainly because it’s easier to avoid unit errors, and more fun to do sensitivity analysis with Synthesim. knife-edge behavior of market volume of alternative fuels as you approach compliance limits (discussed last year): as the required portfolio performance approaches the performance of the best component options, demand for those approaches 100% of volume rapidly. differences in the competitive landscape for technology providers, when compared to alternatives like a carbon tax. differences in behavior under uncertainty. Notice that this is not a normal SD model – there are loops but no stocks. That’s because this is a system of simultaneous equations solved in equilibrium. The Vensim FIND ZERO function is used to find a vector of prices (one for each fuel, plus the shadow price of emissions intensity) that matches supply and demand, subject to the intensity constraint. 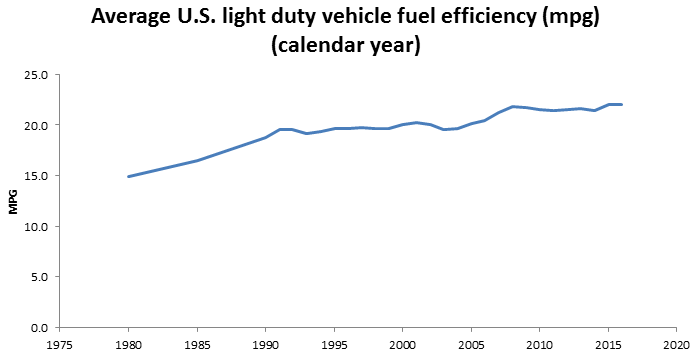 This is the first of several posts on models of the transition to alternative fuel vehicles. 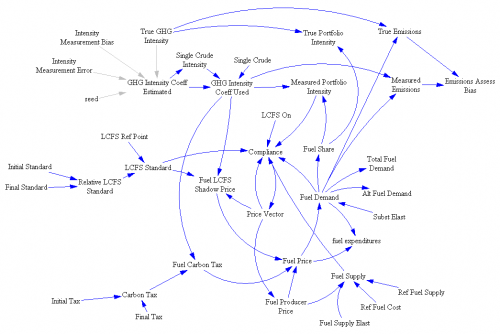 The first looks at a static equilibrium model of the California Low Carbon Fuel Standard (LCFS). Another will look at another model of the LCFS, called VISION-CA, which generates fuel carbon intensity scenarios. Finally, I’ll discuss Jeroen Struben’s thesis, which is a full dynamic model that closes crucial loops among vehicle fleets, consumer behavior, fueling infrastructure, and manufacturers’ learning. At some point I will try to put the pieces together into a general reflection on alt fuel policy. Those who know me might be surprised to see me heaping praise on a static model, but I’m about to do so. Not every problem is dynamic, and sometimes a comparative statics exercise yields a lot of insight. We show this decreases high-carbon fuel production but increases low-carbon fuel production, possibly increasing net carbon emissions. The LCFS cannot be efficient, and the best LCFS may be nonbinding. We simulate a national LCFS on gasoline and ethanol. For a broad parameter range, emissions decrease; energy prices increase; abatement costs are large ($80-$760 billion annually); and average abatement costs are large ($307-$2,272 per CO tonne). A cost effective policy has much lower average abatement costs ($60-$868). The CI of fuel was also calculated across three time periods  so as to compare with displaced fossil energy in a LCFS and to identify the GHG allowances that would be required for biofuels in a cap-and-trade program. Previous CI estimates for California gasoline  suggest that values less than ~96 g CO2eq MJ–1 indicate that blending cellulosic biofuels will help lower the carbon intensity of California fuel and therefore contribute to achieving the LCFS. Entries that are higher than 96 g CO2eq MJ–1 would raise the average California fuel carbon intensity and thus be at odds with the LCFS. Therefore, the CI values for case 1 are only favorable for biofuels if the integration period extends into the second half of the century. For case 2, the CI values turn favorable for biofuels over an integration period somewhere between 2030 and 2050. In both cases, the CO2 flux has approached zero by the end of the century when little or no further land conversion is occurring and emissions from decomposition are approximately balancing carbon added to the soil from unharvested components of the vegetation (roots). Although the carbon accounting ends up as a nearly net neutral effect, N2O emissions continue. Annual estimates start high, are variable from year to year because they depend on climate, and generally decline over time. One of the perplexing issues for policy analysts has been predicting the dynamics of the CI over different integration periods . If one integrates over a long enough period, biofuels show a substantial greenhouse gas advantage, but over a short period they have a higher CI than fossil fuel . Drawing on previous analyses , we argue that a solution need not be complex and can avoid valuing climate damages by using the immediate (annual) emissions (direct and indirect) for the CI calculation. In other words, CI estimates should not integrate over multiple years but rather simply consider the fuel offset for the policy time period (normally a single year). This becomes evident in case 1. Despite the promise of eventual long-term economic benefits, a substantial penalty—in fact, possibly worse than with gasoline—in the first few decades may render the near-term cost of the carbon debt difficult to overcome in this case. You can compare the carbon intensities in the table to the indirect emissions considered in California standards, at roughly 30 to 46 gCO2eq/MJ. Indirect Emissions from Biofuels: How Important? A global biofuels program will lead to intense pressures on land supply and can increase greenhouse gas emissions from land-use changes. Using linked economic and terrestrial biogeochemistry models, we examined direct and indirect effects of possible land-use changes from an expanded global cellulosic bioenergy program on greenhouse gas emissions over the 21st century. Our model predicts that indirect land use will be responsible for substantially more carbon loss (up to twice as much) than direct land use; however, because of predicted increases in fertilizer use, nitrous oxide emissions will be more important than carbon losses themselves in terms of warming potential. A global greenhouse gas emissions policy that protects forests and encourages best practices for nitrogen fertilizer use can dramatically reduce emissions associated with biofuels production. 1 The Ecosystems Center, Marine Biological Laboratory (MBL), 7 MBL Street, Woods Hole, MA 02543, USA. 2 Joint Program on the Science and Policy of Global Change, Massachusetts Institute of Technology (MIT), 77 Massachusetts Avenue, MIT E19-411, Cambridge, MA 02139-4307, USA. 3 Department of Economics, University of São Paulo, Ribeirão Preto 4EES, Brazil. 4 Department of Earth and Environmental Sciences, Lehigh University, 31 Williams Drive, Bethlehem, PA 18015, USA. 5 School of Public Administration, Zhejiang University, Hangzhou 310000, Zhejiang Province, People’s Republic of China (PRC). Expanded use of bioenergy causes land-use changes and increases in terrestrial carbon emissions (1, 2). The recognition of this has led to efforts to determine the credit toward meeting low carbon fuel standards (LCFS) for different forms of bioenergy with an accounting of direct land-use emissions as well as emissions from land use indirectly related to bioenergy production (3, 4). Indirect emissions occur when biofuels production on agricultural land displaces agricultural production and causes additional land-use change that leads to an increase in net greenhouse gas (GHG) emissions (2, 4). 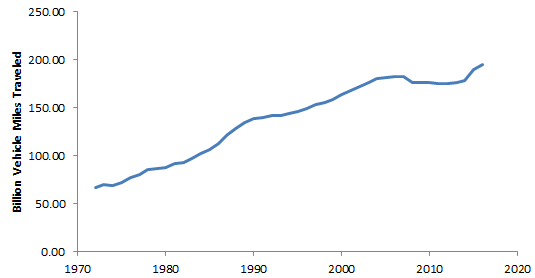 The control of GHGs through a cap-and-trade or tax policy, if extended to include emissions (or credits for uptake) from land-use change combined with monitoring of carbon stored in vegetation and soils and enforcement of such policies, would eliminate the need for such life-cycle accounting (5, 6). There are a variety of concerns (5) about the practicality of including land-use change emissions in a system designed to reduce emissions from fossil fuels, and that may explain why there are no concrete proposals in major countries to do so. In this situation, fossil energy control programs (LCFS or carbon taxes) must determine how to treat the direct and indirect GHG emissions associated with the carbon intensity of biofuels. The methods to estimate indirect emissions remain controversial. Quantitative analyses to date have ignored these emissions (1), considered those associated with crop displacement from a limited area (2), confounded these emissions with direct or general land-use emissions (6–8), or developed estimates in a static framework of today’s economy (3). Missing in these analyses is how to address the full dynamic accounting of biofuel carbon intensity (CI), which is defined for energy as the GHG emissions per megajoule of energy produced (9), that is, the simultaneous consideration of the potential of net carbon uptake through enhanced management of poor or degraded lands, nitrous oxide (N2O) emissions that would accompany increased use of fertilizer, environmental effects on terrestrial carbon storage [such as climate change, enhanced carbon dioxide (CO2) concentrations, and ozone pollution], and consideration of the economics of land conversion. The estimation of emissions related to global land-use change, both those on land devoted to biofuel crops (direct emissions) and those indirect changes driven by increased demand for land for biofuel crops (indirect emissions), requires an approach to attribute effects to separate land uses. We applied an existing global modeling system that integrates land-use change as driven by multiple demands for land and that includes dynamic greenhouse gas accounting (10, 11). Our modeling system, which consists of a computable general equilibrium (CGE) model of the world economy (10, 12) combined with a process-based terrestrial biogeochemistry model (13, 14), was used to generate global land-use scenarios and explore some of the environmental consequences of an expanded global cellulosic biofuels program over the 21st century. The biofuels scenarios we focus on are linked to a global climate policy to control GHG emissions from industrial and fossil fuel sources that would, absent feedbacks from land-use change, stabilize the atmosphere’s CO2 concentration at 550 parts per million by volume (ppmv) (15). The climate policy makes the use of fossil fuels more expensive, speeds up the introduction of biofuels, and ultimately increases the size of the biofuel industry, with additional effects on land use, land prices, and food and forestry production and prices (16). We considered two cases in order to explore future land-use scenarios: Case 1 allows the conversion of natural areas to meet increased demand for land, as long as the conversion is profitable; case 2 is driven by more intense use of existing managed land. To identify the total effects of biofuels, each of the above cases is compared with a scenario in which expanded biofuel use does not occur (16). In the scenarios with increased biofuels production, the direct effects (such as changes in carbon storage and N2O emissions) are estimated only in areas devoted to biofuels. Indirect effects are defined as the differences between the total effects and the direct effects. At the beginning of the 21st century, ~31.5% of the total land area (133 million km2) was in agriculture: 12.1% (16.1 million km2) in crops and 19.4% (25.8 million km2) in pasture (17). In both cases of increased biofuels use, land devoted to biofuels becomes greater than all area currently devoted to crops by the end of the 21st century, but in case 2 less forest land is converted (Fig. 1). Changes in net land fluxes are also associated with how land is allocated for biofuels production (Fig. 2). 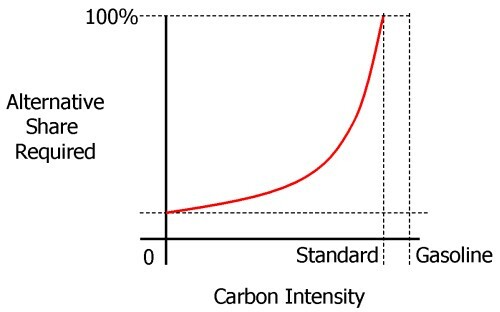 In case 1, there is a larger loss of carbon than in case 2, especially at mid-century. Indirect land use is responsible for substantially greater carbon losses than direct land use in both cases during the first half of the century. In both cases, there is carbon accumulation in the latter part of the century. The estimates include CO2 from burning and decay of vegetation and slower release of carbon as CO2 from disturbed soils. The estimates also take into account reduced carbon sequestration capacity of the cleared areas, including that which would have been stimulated by increased ambient CO2 levels. Smaller losses in the early years in case 2 are due to less deforestation and more use of pasture, shrubland, and savanna, which have lower carbon stocks than forests and, once under more intensive management, accumulate soil carbon. Much of the soil carbon accumulation is projected to occur in sub-Saharan Africa, an attractive area for growing biofuels in our economic analyses because the land is relatively inexpensive (10) and simple management interventions such as fertilizer additions can dramatically increase crop productivity (18). [in a new window] Fig. 1. Projected changes in global land cover for land-use case 1 (A) and case 2 (B). In either case, biofuels supply most of the world’s liquid fuel needs by 2100. In case 1, 365 EJ of biofuel is produced in 2100, using 16.2% (21.6 million km2) of the total land area; natural forest area declines from 34.4 to 15.1 million km2 (56%), and pasture area declines from 25.8 to 22.1 million km2 (14%). In case 2, 323 EJ of biofuels are produced in 2100, using 20.6 million km2 of land; pasture areas decrease by 10.3 million km2 (40%), and forest area declines by 8.4 million km2 (24% of forest area). Simulations show that these major land-use changes will take place in the tropics and subtropics, especially in Africa and the Americas (fig. S2). [in a new window] Fig. 2. Partitioning of direct (dark gray) and indirect effects (light gray) on projected cumulative land carbon flux since the year 2000 (black line) from cellulosic biofuel production for land-use case 1 (A) and case 2 (B). Positive values represent carbon sequestration, whereas negative values represent carbon emissions by land ecosystems. In case 1, the cumulative loss is 92 Pg CO2eq by 2100, with the maximum loss (164 Pg CO2eq) occurring in the 2050 to 2055 time frame, indirect losses of 110 Pg CO2eq, and direct losses of 54 Pg CO2eq. In the second half of the century, there is net accumulation of 72 Pg CO2eq mostly in the soil in response to the use of nitrogen fertilizers. In case 2, land areas are projected to have a net accumulation of 75 Pg CO2eq as a result of biofuel production, with maximum loss of 26 Pg CO2eq in the 2035 to 2040 time frame, followed by substantial accumulation. Estimates of land devoted to biofuels in our two scenarios (15 to 16%) are well below the estimate of 50% in a recent analysis (6) that does not control land-use emissions. The higher number is based on an analysis that has a lower concentration target (450 ppmv CO2), does not account for price-induced intensification of land use, and does not explicitly consider concurrent changes in other environmental factors. In analyses that include land-use emissions as part of the policy (6–8), less area is estimated to be devoted to biofuels (3 to 8%). The carbon losses associated with the combined direct and indirect biofuel emissions estimated for our case 1 are similar to a previous estimate (7), which shows larger losses of carbon per unit area converted to biofuels production. These larger losses per unit area result from a combination of factors, including a greater simulated response of plant productivity to changes in climate and atmospheric CO2 (15) and the lack of any negative effects on plant productivity of elevated tropospheric ozone (19, 20). We also simulated the emissions of N2O from additional fertilizer that would be required to grow biofuel crops. Over the century, the N2O emissions become larger in CO2 equivalent (CO2eq) than carbon emissions from land use (Fig. 3). The net GHG effect of biofuels also changes over time; for case 1, the net GHG balance is –90 Pg CO2eq through 2050 (a negative sign indicates a source; a positive sign indicates a sink), whereas it is +579 through 2100. For case 2, the net GHG balance is +57 Pg CO2eq through 2050 and +679 through 2100. We estimate that by the year 2100, biofuels production accounts for about 60% of the total annual N2O emissions from fertilizer application in both cases, where the total for case 1 is 18.6 Tg N yr–1 and for case 2 is 16.1 Tg N yr–1. These total annual land-use N2O emissions are about 2.5 to 3.5 times higher than comparable estimates from an earlier study (8). Our larger estimates result from differences in the assumed proportion of nitrogen fertilizer lost as N2O (21) as well as differences in the amount of land devoted to food and biofuel production. Best practices for the use of nitrogen fertilizer, such as synchronizing fertilizer application with plant demand (22), can reduce N2O emissions associated with biofuels production. [in a new window] Fig. 3. Partitioning of greenhouse gas balance since the year 2000 (black line) as influenced by cellulosic biofuel production for land-use case 1 (A) and case 2 (B) among fossil fuel abatement (yellow), net land carbon flux (blue), and fertilizer N2O emissions (red). Positive values are abatement benefits, and negative values are emissions. Net land carbon flux is the same as in Fig. 2. For case 1, N2O emissions over the century are 286 Pg CO2eq; for case 2, N2O emissions are 238 Pg CO2eq. The CI of fuel was also calculated across three time periods (Table 1) so as to compare with displaced fossil energy in a LCFS and to identify the GHG allowances that would be required for biofuels in a cap-and-trade program. Previous CI estimates for California gasoline (3) suggest that values less than ~96 g CO2eq MJ–1 indicate that blending cellulosic biofuels will help lower the carbon intensity of California fuel and therefore contribute to achieving the LCFS. Entries that are higher than 96 g CO2eq MJ–1 would raise the average California fuel carbon intensity and thus be at odds with the LCFS. Therefore, the CI values for case 1 are only favorable for biofuels if the integration period extends into the second half of the century. For case 2, the CI values turn favorable for biofuels over an integration period somewhere between 2030 and 2050. In both cases, the CO2 flux has approached zero by the end of the century when little or no further land conversion is occurring and emissions from decomposition are approximately balancing carbon added to the soil from unharvested components of the vegetation (roots). Although the carbon accounting ends up as a nearly net neutral effect, N2O emissions continue. Annual estimates start high, are variable from year to year because they depend on climate, and generally decline over time. The legislation has four titles: (1) a ‘clean energy’ title that promotes renewable sources of energy and carbon capture and sequestration technologies, low-carbon transportation fuels, clean electric vehicles, and the smart grid and electricity transmission; (2) an ‘energy efficiency’ title that increases energy efficiency across all sectors of the economy, including buildings, appliances, transportation, and industry; (3) a ‘global warming’ title that places limits on the emissions of heat-trapping pollutants; and (4) a ‘transitioning’ title that protects U.S. consumers and industry and promotes green jobs during the transition to a clean energy economy. One key issue that the discussion draft does not address is how to allocate the tradable emission allowances that restrict the amount of global warming pollution emitted by electric utilities, oil companies, and other sources. This issue will be addressed through discussions among Committee members. Biofuels, dost thou protest too much? Following up on yesterday’s LCFS item, a group of biofuel researchers have written an open letter to the gubernator, protesting the inclusion of indirect land use emissions in biofuel assessments for the LCFS. The letter is followed by 12 pages of names and affiliations – mostly biologists, chemical engineers, and ag economists. They ask for a 24-month moratorium on regulation of indirect land use effects, during which all indirect or market-mediated effects of petroleum and alternative fuels would be studied. I have mixed feelings about this. On one hand, I don’t think it’s always practical to burden a local regulation with features that attempt to control its nonlocal effects. Better to have a simple regulation that gets imitated widely, so that nonlocal effects come under control in their own jurisdictions. On the other hand, I don’t see how you can do regional GHG policy without some kind of accounting for at least the largest boundary effects. Otherwise leakage of emissions to unregulated jurisdictions just puts the regions who are trying to do the right thing at a competitive disadvantage. Author TomPosted on March 12, 2009 Categories Climate, energy, Low Carb Fuels, Policy, Regional Climate Initiatives, transportTags biofuels, California, LCFS, transportLeave a comment on Biofuels, dost thou protest too much? To avoid creating greenhouse gases, it makes more sense using today’s technology to leave land unfarmed in conservation reserves than to plow it up for corn to make biofuel, according to a comprehensive Duke University-led study. “Converting set-asides to corn-ethanol production is an inefficient and expensive greenhouse gas mitigation policy that should not be encouraged until ethanol-production technologies improve,” the study’s authors reported in the March edition of the research journal Ecological Applications. Corn rose for a fourth straight session, the longest rally this year, after the U.S. government unexpectedly increased its estimate of the amount of grain that will be used to make ethanol. House Speaker Nancy Pelosi, a California Democrat, and Senator Amy Klobuchar, a Minnesota Democrat, both said March 9 they support higher amounts of ethanol blended into gasoline. On March 6, Growth Energy, an ethanol-industry trade group, asked the Environmental Protection Agency to raise the U.S. ratio of ethanol in gasoline to 15 percent from 10 percent. This left me wondering where California’s assessments of low carbon fuels now stand. Last March, I attended a collaborative workshop on life cycle analysis of low carbon fuels, part of a series (mostly facilitated by Ventana, but not this one) on GHG policy. The elephant in the room was indirect land use emissions from biofuels. At the time, some of the academics present argued that, while there’s a lot of uncertainty, zero is the one value that we know to be wrong. That left me wondering what plan B is for biofuels, if current variants turn out to have high land use emissions (rendering them worse than fossil alternatives) and advanced variants remain elusive. 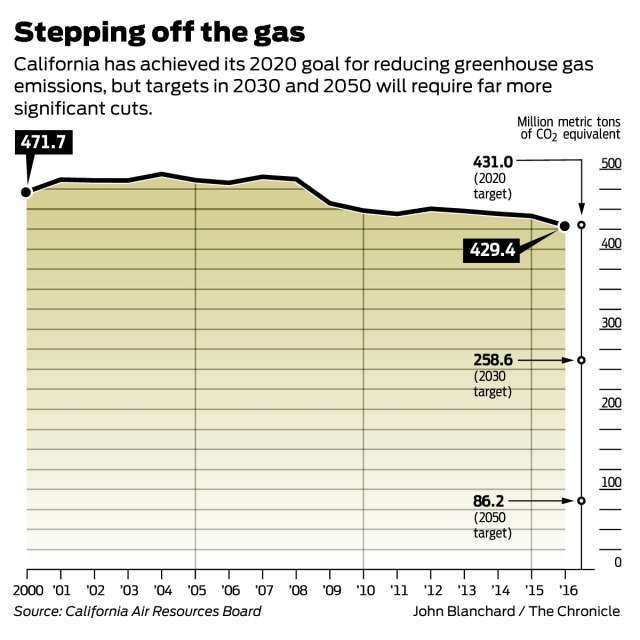 It turns out to be an opportune moment to wonder about this again, because California ARB has just released its LCFS staff report and a bunch of related documents on fuel GHG intensities and land use emissions. The staff report burdens corn ethanol with an indirect land use emission factor of 30 gCO2eq/MJ, on top of direct emissions of 47 to 75 gCO2eq/MJ. That renders 4 of the 11 options tested worse than gasoline (CA RFG at 96 gCO2eq/MJ). Brazilian sugarcane ethanol goes from 27 gCO2eq/MJ direct to 73 gCO2eq/MJ total, due to a higher burden of 46 gCO2eq/MJ for land use (presumably due to tropical forest proximity). These numbers are a lot bigger than the zero, but also a lot smaller than Michael O’Hare’s 2008 back-of-the-envelope exercise. For example, for corn ethanol grown on converted CRP land, he put total emissions at 228 gCO2eq/MJ (more than twice as high as gasoline), of which 140 gCO2eq/MJ is land use. Maybe the new results (from the GTAP model) are a lot better, but I’m a little wary of the fact that the Staff Report sensitivity ranges on land use (32-57 gCO2eq/MJ for sugarcane, for example) have such a low variance, when uncertainty was previously regarded as rather profound. Clearly, if a fuel’s i is less than x, s=x/i would have to exceed 1, which is impossible, so you couldn’t meet the constraint with that fuel alone (though you could still use it, supplemented by something better). Thus land use emissions are quite debilitating for conventional ethanol fuels’ role in the LCFS. For example, ignoring land use emissions, California dry process ethanol has intensity ~=59, or i=0.39. To make a 10% cut, x=0.1, you’d need s=0.26 – 26% market share is hard, but doable. But add 30 gCO2eq/MJ for land use, and i=0.07, which means you can’t meet the standard with that fuel alone. Even the best ethanol option, Brazilian sugarcane at i=0.24, would have 42% market share to meet the standard. This means that the alternative to gasoline in the LCFS would have to be either an advanced ethanol (cellulosic, not yet evaluated), electricity (i=0.6) or hydrogen. As it turns out, that’s exactly what the new Staff Report shows. 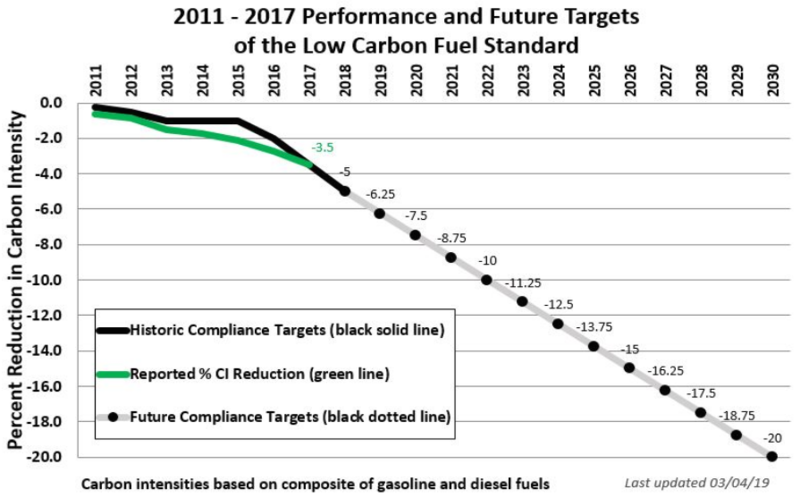 In the new gasoline compliance scenarios in table ES-10, conventional ethanol contributes at most 5% of the 2020 intensity reduction. Chapter VI of the Staff Report describes compliance scenarios in more detail. Of the four scenarios in the gasoline stovepipe, each blends 15 to 20% ethanol into gasoline. That ethanol is in turn about 10% conventional (Midwest corn or an improved CA variant with lower intensity) and up to 10% sugarcane. The other 80 to 90% of ethanol is either cellulosic or “advanced renewable” (from forest waste). That makes the current scenarios a rather different beast from those explored in the original UC Davis LCFS technical study that provides the analytical foundation for the LCFS. I dusted off my copy of VISION-CA (the model used, and a topic for another post some day) and ran the 10% cut scenarios. Some look rather like the vision in the current staff report, with high penetration of low-intensity fuels. But the most technically diverse (and, I think, the most plausible) scenario is H10, with multiple fuels and vehicles. The H10 scenario’s ethanol is still 70% conventional Midwest corn in 2020. It also includes substantial “dieselization” of the fleet (which helps due to diesel’s higher tank-to-wheel efficiency). I suspect that H10-like scenarios are now unavailable, due to land use emissions (which greatly diminish the value of corn ethanol) and the choice of separate compliance pathways for gasoline and diesel. The new beast isn’t necessarily worse than the old, but it strikes me as higher risk, because it relies on the substantial penetration of fuels that aren’t on the market today. If that’s going to happen by 2020, it’s going to be a busy decade.